It's 4pm aboard the just-launched Carnival Breeze and while the bars are humming, this too-late-for-lunch-too-early-for-dinner hour tends to be a bad time for anyone looking for food, which would be me. But just when I’m thinking that my choices will be limited to ice cream (not enough) or a sandwich (boring), I turn a corner and find myself staring straight at a guy hand-making pizzas. I’d read about Pizza Pirate in my cabin, but assumed, I suppose because of the name, that it would be more of a kid-centric Chuck E. Cheese-type place. Instead, I found a tiny pizzeria turning out plate-sized made-to-order pies. Eight minutes after placing my order for a margherita pizza, (four cheese, mushroom, and pepperoni are also on the menu), I found myself biting into a hot, blistered crust topped with fresh-tasting sauce and even buffalo mozzarella. And the best part? It was free. As passengers have demanded more variety and better quality over the years, the cruise industry has responded with specialty restaurants featuring stars of the stove, regional cuisine, and show-stopping ingredients. The only problem is that these experiences are often à la carte or require a per person supplement that can range from $10 to more than $50. That trend is changing and today, more and more cruise ships are making meals outside of a main dining room a worthwhile experience that won’t add to your tab. 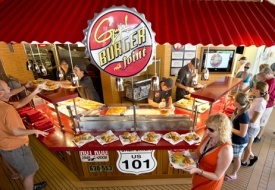 Aboard the Breeze and Carnival Liberty, for instance, passengers can dig into burgers at Guy’s Burger Joint (shown at left), which was created in partnership with Food Network personality Guy Fieri. Fieri took the project seriously, designing and naming every burger on the menu and even asking Carnival to ship him several pounds of the beef they planned to use so he could test it out for himself. There’s also BlueIguana Cantina, which makes its tacos, burritos, and, in the morning, breakfast wraps, with homemade tortillas hot off the press. On the side, the salsa bar is stocked with zippy offerings that go way beyond Old El Paso like salsa roja and a refreshing crudo of watermelon and jicama. During sea days on the Breeze, Fat Jimmy’s C-Side BBQ grills up chicken, veggies, and sausage on a gigantic outdoor grill. Carnival isn’t alone. Passengers aboard Royal Caribbean’s Allure of the Seas, Splendour of the Seas, and Radiance of the Seas can choose from eight varieties of hot dogs, including brats and smoked pork sausage, from Boardwalk Dog House while diners at Regent’s Prime 7 can tuck into perfectly seared dry-aged steaks and Maine lobster without spending an extra dime. Oceania’s newest ships, the Riviera and Marina, feature Jacques, an elegant French bistro designed by renowned chef Jacques Pepin. Pepin, who has been Oceania’s culinary director for years, was so involved in the development of the restaurant that he chose artwork from his personal collection to hang on the walls. Although the menu is chock full of classic French fare like escargot, perfectly imagined French onion soup and bouillabaisse, guests will also find Pepin’s famous specialties like pumpkin soup à l’Anglaise, which arrives at the table in a hollowed-out pumpkin shell. Find the latest news and advice in our cruise hub, then search our cruise deals.